You should add my new Hand Built blog to your RSS reader. Going forward, I’ll be using this blog for personal stories, photos, and so on. New WP-CLI maintainer: Daniel Bachhuber. Yep! Big news to announce. Which, unfortunately, requires I launch my new theme design. Which, unfortunately, requires I finish configuring the new Rackspace Cloud server that needs to host the new theme design. Tk in due time. How we provide real user monitoring: A quick technical review. My favorite stack monitoring application just got 10x better. In addition to tracking application and database response times, New Relic now also measures what the user experiences in their browser. Wicked. Highrise now has custom fields! Highrise now has custom fields! Its utility just went up 10x. Most valuable: filtering contacts by custom fields. Now we wait for Wufoo to upgrade their API integration. Posted byDaniel Bachhuber May 3, 2011 Posted inasidesTags: 37signals, announcements, CRM, HighriseLeave a comment on Highrise now has custom fields! At TechCrunch Disrupt earlier today, Scott Karp announced Publish2 News Exchange, a product we hope will be an elegant way for news organizations to collaborate. Specifically, P2X offers scalable content-sharing networks for newspapers, and affords online-only publications the opportunity to have their content syndicated in print. This, in conjunction with a redesigned link journalism system and the seeds of a tool to maximize the production of high-quality journalism, makes the news industry full of significant opportunities if you know were to look. We’re rolling out Publish2 News Exchange to existing Publish2 users this week and, as always, journalists can register for free accounts. Alternate title for this post: Let the exodus continue. The Python conversion script CoPress used to migrate over 50 student publications to the glorious free and open source WordPress is now itself licensed under GPL version 2. It’s optimized for College Publisher 4 and College Publisher 5 databases, but will also work with most any database you can turn into a flat CSV file. You can fork it on Github or download the brand new 1.0 release. Right off the bat, I’d like to say that the most awesome bit about the conversion script is its ease of use. Granted, you do have to run it on the command line and it does often throw mythical, unintelligible errors if your data is screwy, but it’s about 100 to 1,000 times easier than what Sean Blanda or Brian Schlansky had to go through. 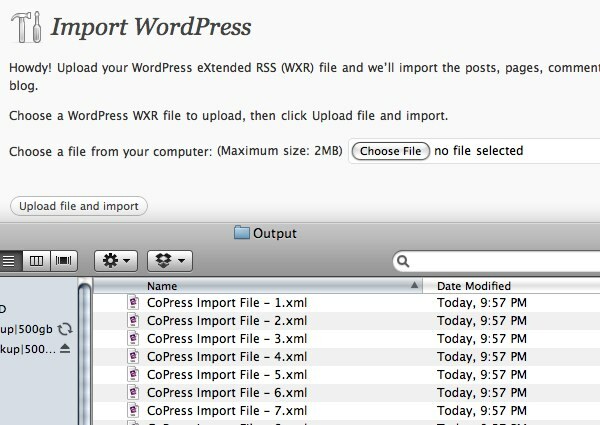 Furthermore, it spits out WordPress eXtended RSS files that WordPress imports natively. Depending on the size of your archives, you could even do the entire migration in less than a half hour. There are detailed instructions in the README I encourage you to read thoroughly but, in screenshots, here’s how you’d migrate your site. Backup your database using Sequel Pro. This is a critically important step, as you’ll definitely want a clean version to revert to if the import goes awry. Once the script is running, you’ll be asked a series of questions to configure the conversion process. Most options are self-explanatory, and all are explained fully in the README file packaged with the script. The most important thing I’d like to note in this post is that, unless you have less than 500 authors in your archives, I’d highly, highly recommend importing your authors as custom fields instead of users. WordPress is not optimized to add a large number of new users through its import process. We learned this the hard way migrating CM Life‘s database last summer. When the script is done, you’ll have a series of WordPress eXtended RSS files you can easily upload into WordPress. Mad props go to Miles Skorpen for the long hours he spent on the conversion script, and to Albert Sun, Will Davis, and Max Cutler for their later contributions. Feel free to send along any suggestions for improvement, bugs, fixes or general comments. I intend to maintain it for the indefinite future, it’s good Python practice when everything else I’m working on is PHP, but code contributions are always welcome. There is a short list of upgrades under consideration in the top of the script. As of yesterday evening, I am no longer an employee of the Oregon Daily Emerald. My decision comes after two months of frustration trying to get the Daily Emerald off of College Publisher. College Publisher, for those who are unaware, is a proprietary, locked, and nearly obsolete content management system (CMS). In my opinion, the first step student newspapers must take to survive in this “digital era” is to invest significantly in adopting an open source platform for their web presence. Open source allows a student newspaper to truly evolve into a student news organization. It offers the ability for you to have the final say in how, where, and why you publish your content. In proprietary systems, you leave this technological innovation up to the company to whom you’ve contracted out the work. A metaphor for the people who have grown up with print: open source means your newspaper design and layout can be just whatever the heck you want them to be. Proprietary code means that you only have a certain number of colors, fonts, and article lengths to work with. Your sections always stay in the same location, and you can only adjust the placement of the stories to the smallest degree. All of those innovative front page newspaper designs from last Wednesday? Those wouldn’t be possible with proprietary code. At the Daily Emerald, however, I was told we must first hire a publisher before we can consider any changes to our CMS. On top of that, we have a contract with College Publisher for at least the next six months (although we receive very little money from the deal so I’m not exactly sure what the Daily Emerald would lose by breaking the contract). Furthermore, the board meetings are closed. This means that I, the guy with Google Doc upon Google Doc of ideas, have to be invited to participate in the decision making process. To me, this sounds completely illogical. Instead, I have to pester the already overworked EIC with the things I’d like to do, and then have those suggestions go up the “chain of command.” It’s not a functional system for the real change which needs to happen. Competition from the people who get it.